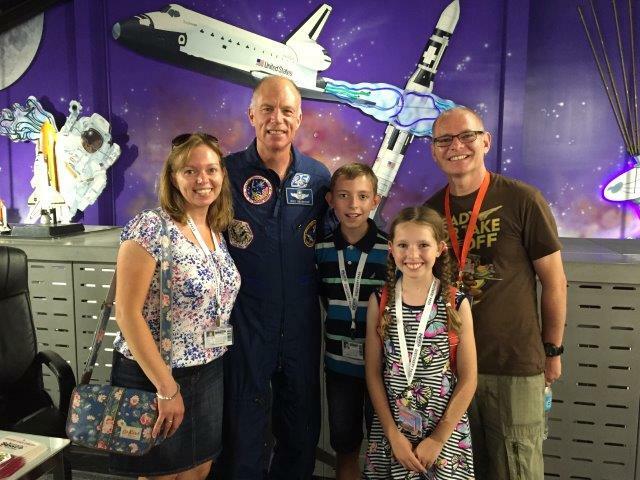 We are Neil & Camilla Heron and have a son Alex and daughter Marissa - Pictured above at Kennedy Space Center meeting one of the Shuttle Astronauts. We own both Sunshine Villa and Sundance Villa. Sunbeam Villa and Sunray Villa are owned by other family members, however we arrange all the booking and administration of the villas on their behalf. With our experience in both property rentals and the travel industry put to good use we soon found that we could not meet the demand for Sunshine Villa, especially during peak seasons, so decided to invest in a second home - Sundance Villa. As we were also getting lots of enquiries from our previous guests that had rented Sunshine Villa with their extended families but wanted to return on their own and didn't need such a large home, we decided to go for a smaller 4 bedroom villa but to make it even more luxurious inside. We are huge Disney fans and have visited the Parks since we were kids ourselves, and our own kids have been visiting every year since they were babies so have a wealth of experience in both Disney and family vacations to Florida. We are always happy to assist our guests with planning their own Disney vacations. Sunray Villa is owned by Neil's parents, Wilma & George, and Sunbeam Villa is owned by his sister and family, Julie & Robin so it is quite a family affair and why we are so good at catering for family vacations.